Managed accounts are active directory accounts for SharePoint's whose credentials are managed by SharePoint. Managed accounts in SharePoint 2013 is explained in my another article: Configuring Managed Accounts in SharePoint 2013. Important: Before creating a managed account, They must be already created in your Active directory. How to create a managed account in SharePoint 2013? Open SharePoint 2013 Central administration site. Go Security >> Click on Configure Managed Accounts. Click the Register Managed Account link to create a new managed account. Enter the account’s AD username in domain\username format. Specify the account's password. Optionally, You can enable the automatic password reset. Click "OK" to to create managed account in SharePoint 2013. Important: To register managed account SharePoint 2013, You must be a member of Farm Administrators SharePoint group. 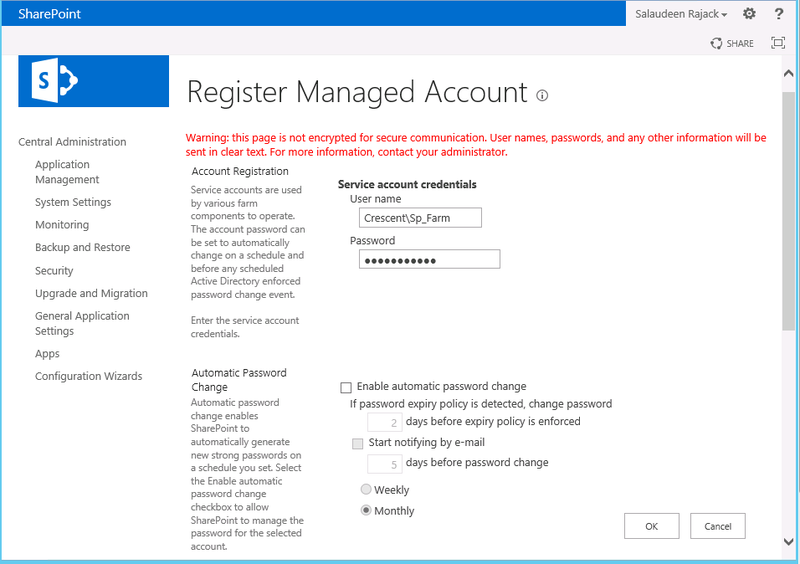 This prompts to enter credentials and register managed account in SharePoint 2013/2016. Here, I've specified a common password for all managed account. However, you can specify different passwords for different service accounts. You may get access denied error when you try to register a managed account via Central Administration, You'll get this error: >> Security >> Configure Managed Account >> Register Managed Account. Make sure either you are running SharePoint Management shell as administrator or UAC is disabled prior executing PowerShell cmdlets. Verify that your service account is allowed to change password from its properties - “User cannot change password” ! if "Automatic Password reset" property is already enabled for your managed account, you may get "Access denied" error! Remove that existing account and crate a new one. Use PowerShell to register new managed account!